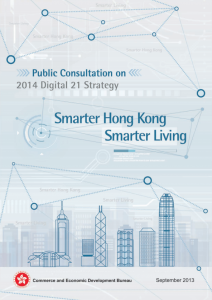 I wished to add some perspective to the role that open data can play in the Digital 21 Strategy. The passage below from the public consultation provides a very simplistic portrayal of how every government should proceed when it comes to open data. This statement does not go far enough. The success of any open data strategy is dependant upon whether it gets embedded in the culture of how all Government Departments function. It is not sufficient to say that data will be released in machine-readable formats. Instead, there needs to be a greater emphasis on the idea that much of the information that is produced by the Government should be publicly released immediately (produced to be made public). The position that Data.One has taken is exploratory at best. They seek to find ‘high-value’ datasets and help release them. This endeavour misses the point. Who is to say what value particular information may have? As part of the Journalism and Media Studies Centre at The University of Hong Kong, I know that the value of information is sometimes only seen over time and after much examination. The true benefits of open data come when a government believes in the importance of exposing how they function. This leads to greater scrutiny, but also greater understanding. The well-functioning government works with all its stakeholders, and this includes its citizens and public and private organisations. The Code on Access to Information sits at the heart of the role of open data in Hong Kong. Many have been calling for a Freedom of Information Act to provide a legal framework in which to reliably get information. Even setting this issue aside and focusing on the relationship between a government and its information, it is safe to say that the Government is in the information business. It is essential to its health to produce as much public information as possible The Hong Kong Government has a robust press release system, and yet it suffers from two main issues. The first is that press releases are in a non-machine-readable format and there are not sufficient mechanisms to programmatically search the archives. This is a small technical issue compared to the second issue. The real problem is that HKG (and they are not alone in this) still believe their role is to explain the meaning and value of the information released. This process is an archaic view of government information. Just like Data.One’s view of ‘high-valued’ datasets, the value of information should be open to the experts in those fields. One of the many jobs that Journalists provide is to make sense of information. When we to work with raw data, we are able to connect the dots in a much more meaningful way. Instead, we are faced with decrypting a typical Government press release. There is truth in data. The Government of Hong Kong does good work, and it behoves itself to illustrate that with its data. The first being that HKG needs to create a ‘culture of open’. This is perhaps a slightly strange term, but it truly embodies the intent that governments the world over should have. And since the 2014 Digital Strategy is meant to be a roadmap for the next many years, it will be essential that it articulates the principles of using technology to improve its information architecture and exchange. And this is, it should be noted, not specifically a technological issue. Although technology appears to drive much of what we do, it is nevertheless grounded in deeper principles. If the section on open data does not include reference to opening and improving the access to information, by establishing a long term goal of releasing information ‘early and often’, this passage will do nothing more than position the government as a non-agile organisation. The final point is that government departments will look to this strategy as a way to interpret their relationship to information. The more open the language is, the more encouraging the OGCIO can be. We have found in many cases that some departments are simply unsure whether they can release information when it is requested. It is somewhat telling that the Guide on the Code of Access to Information is almost 5 times as long as the actual Code. Hong Kong should learn from the United Kingdom which has set in motion a well-established FOIA, which includes a very meaningful archives law. They have also gone on to guide their employees with things like the need to define a public task. This kind of guidance will help to establish a culture of open and enable quicker innovation and advancement in technology, in a way that a prescription for more machine-readable data (and a few APIs) could ever do. Thank you for the opportunity to provide some feedback. I look forward to seeing Hong Kong embrace its role as a 21st century global city. 34. Through different channels (like press releases, publications, websites, etc. ), the Government releases a lot of information in different areas. However, most of such information can only be read but cannot be used. In view of the immense benefits of widening access to PSI for free and easy re-use, we propose to make all Government information released for public consumption machine-readable by default. Where appropriate, datasets will be released with application programming interfaces (APIs), providing predefined functions to make their retrieval easier. Previous PostI’m tired of looking at websites. I want to use them.